Hello everyone, I’m incredibly happy to say that I’ve got some good news to share with you. Earlier this year I returned to my first manuscript The Hidden Bones to give it a work over and ensure that it was as good as it could possibly be. Any writer will tell you that taking the plunge and sending your manuscript out to an agent is a nerve-wracking experience. It’s a little like seeing your child leave home. You’ve created them and raised them and you’re full of hope and pride. But it’s mixed with an (un)healthy smattering of worry and doubt about how things will turn out when they have to fend for themselves in the outside world. So it was with a combination of anticipation and trepidation that I took a deep breath and sent it out in search of an agent. There were an anxious few weeks, and much checking of inboxes, as I waited for a response. But I’m absolutely delighted to say that all of the hard work (and worry) was worth it, and I’m now represented by the fabulous Northbank Talent Management. It’s far from the end of my journey to publication, but it is an incredibly important step. And I’m really looking forward to sharing that journey with Diane Banks and her team. 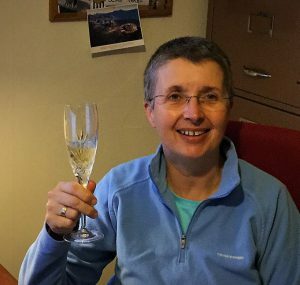 So last evening I rewarded myself with a glass or two of something fizzy, and want to say a big thank you to everyone who has supported and encouraged me along the way. Cheers!